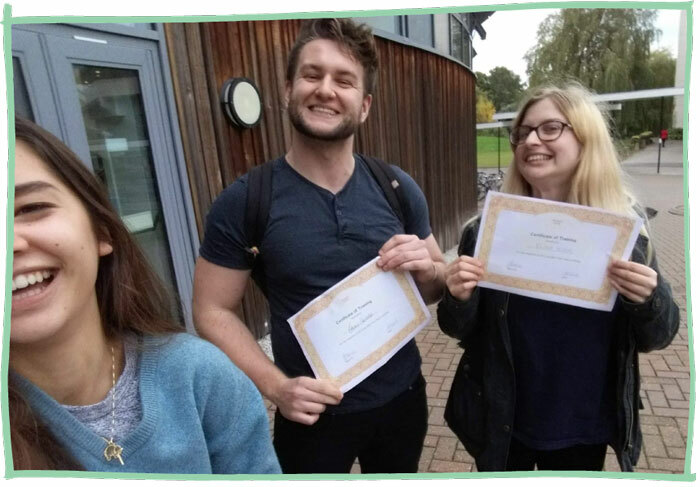 Our innovative and engaging one day training programme enables university staff to deliver our Look After Your Mate workshop which empowers students to support friends experiencing mental health difficulties whilst looking after their own wellbeing. ​For students, navigating university life can be tricky at times and we know how important it is for an individual to reach out to their friends in times of need. We want students to feel confident in supporting their friends and feel comfortable confiding in each other. An overview of the Look After Your Mate workshop. Based on the Look After Your Mate guide for friends, the workshop covers an introduction to student mental health and the student experience, understanding when a friend may be struggling, communication techniques, signposting and boundaries, self-care and looking after yourself whilst supporting a friend. Advertising the Look After Your Mate workshop on campus. Following the training, you will be supported by a member of staff at all times to help you get up and running. You will be expected to run at least one Look After Your Mate workshop at your institution per year, and you will receive a number of resources (available on our Trainer Hub) to help you run the programme successfully. We also offer Continuing Professional Development events to ensure you remain secure in the knowledge, confidence and skills to deliver successful Look After Your Mate workshops. Please see the FAQs at the bottom of this page for more information. ​ More dates will be announced soon! If you'd like to be alerted to future training dates, or are unable to attend the dates listed, please register your interest in future training courses. Attendance on the Look After Your Mate Train the Trainer programme costs £275 per person (plus an annual £50 membership and licensing fee per person - please see below for more information). Travel and accommodation expenses for our trainer team. If you're interested in requesting in-house training please email training@studentminds.org.uk. We can issue you with an invoice, which is payable in advance of the training course via BACS or you can pay via PayPal using the button. ​Unfortunately we are unable to accept payment over the phone. health awareness and supporting a friend. 93% rated the training 'useful' or 'very useful'. 91% rated their skills to run the Look After Your Mate workshop on their campus 'good' or 'very good'. 33% increase in their skills to support a friend experiencing mental health difficulties. 38% increase in their confidence to signpost a friend to further support. And 95% found the workshop 'useful' or 'very useful'. "Comprehensive training which is accessible to people from a range of backgrounds. Clearly well thought through and I appreciated the emphasis on feedback and the responsiveness to this." Unfortunately we are unable to train students who are currently studying, and this includes students with part-time welfare related roles. The price of the one-day course is £275 plus an annual £50 fee. You can pay via the PayPal link above or we can issue you with an invoice, which is payable in advance of the training course via BACS. Unfortunately we are unable to accept payments over the phone. The training runs from 09:30 - 17:00 for one day. Where is the Leeds training venue? Our Leeds training takes place at our office (17 Springfield Mount, Leeds, LS2 9NE). Please note, there is no lift. If you have any access requirements please get in touch with us as soon as possible. We are a 20 minute walk from the train station. You can find a list of car parks here. - Trainers must have attended the full Student Minds trainer programme prior to running Look After Your Mate workshops. - Trainers must deliver a minimum of one Look After Your Mate workshop for free at your institution within one year of being trained. The course cannot be run for profit. - Trainers are also required to renew their membership annually by completing the required LAYM Train the Trainer refresher training online and paying the annual membership and licensing fee. - Trainers agree to register all Look After Your Mate workshops with Student Minds and use the registration form provided for attendee sign ups. After each workshop, trainers must provide attendance data, trainer feedback and attendee feedback to Student Minds, following the Impact Measurement Guidelines outlined by Student Minds. - Workshops will be run according to the structure outlined in the training programme and the content will not be amended or added to without prior consent from Student Minds. Trainers agree to implement updates to the workshop content as and when these are disseminated.